Your pieces are displayed like unique leaves on this handcrafted tree. When the last leaf falls from its tree for the season, intricate twisting and intertwining is left on display. That beautiful complexity is captured in this brass jewelry stand handcrafted by Indian artisans, your pieces dangling like unique leaves. Handmade in India. thanks for the convenient idea! The tree does not sit well on its stand. the design is flimsy and the tree wants to fall off all the time. it is not fixed to the tree stump, if you like! 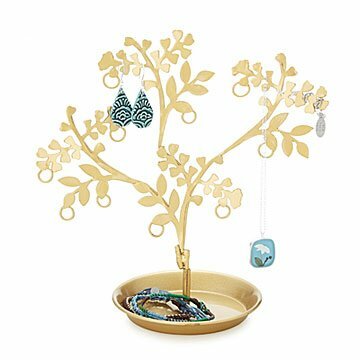 I thought this jewelry tree was pretty but definitely not made with quality materials and very flimsy. It's a pricey item and especially when the size and construction is so poor, not a good value, so I returned it. I would absolutely buy this product. My granddaughter typically puts her jewelry on the bathroom countertop. It is often misplaced. This gift is not only a keepsake but reduces the risk of losing her jewelry.